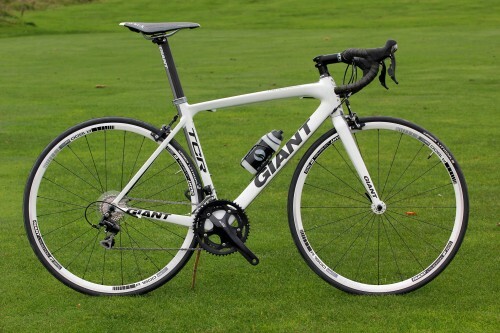 We’ve been surprised by the Giant TCR Advanced 2. In a good way. To be honest, I was expecting a solid, workmanlike machine, but not necessarily any fireworks. Something that ticks all the boxes, covers the bases, does the job… but perhaps not with a great deal of flare. What I got is a fast and lively bike that’s smooth-riding too. It’s right up there among the best in its class. Why did I think this would be a down-the-middle kind of a bike. Well, I guess it’s because I jumped to conclusions based of the equipment on display here. This is a £2,250 bike that comes fitted with a mid-range Shimano 105 groupset. Now don’t get us wrong, we’re big fans of 105, but you can get it on bikes costing half the price. Over about two grand you start to expect a smattering of next-level-up Ultegra. This is about top whack for a bike that’s 105 throughout. Most of the other components are in-house models – not all, but most. The fork, bar, stem and seatpost are Giant branded. So what? All we’re saying is that on first impressions the TCR Advanced 2 didn’t make us think that Giant had pushed the boat out here. The spec sheet isn’t especially inspiring so we didn’t think we were in line for a sparkling ride. But we were wrong. 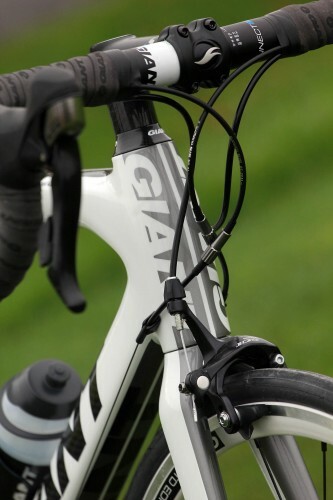 At the heart of everything is the Advanced composite frame that Giant produce in their own factory. It’s made from T-700 raw composite material – the middle of the three grades that Giant use – and it’s very neatly done. As usual with Giant, the top tube slopes steeply – they were the pioneers of this compact design, after all. Can’t say I'm too bothered either way about a compact frame but some people feel more confident with a lower standover height – there’s less chance of a nasty incident if you need to get your feet on the ground in a hurry. The bulging head tube forms a huge junction up front with the top tube extending down to meet the down tube coming up. It houses a standard 1 1/8in upper headset bearing and, as is increasingly common on high-performance bikes, a 1 1/4in lower bearing for a little extra meatiness. The down tube, not to put too fine a point on it, is a colossal piece of work. It’s square-edged and the old road.cc ruler says it measures 5.6cm across, which might not mean a lot in itself but, believe us, it’s really not going to be pushed around whatever type of power you throw at it. The bottom bracket shell is a mighty block that accommodates a Shimano press fit BB. Don’t get us started on the proliferation (yes, proliferation) of different bottom bracket standards that are out there at the moment and the attendant (yes, attendant) complications that brings in terms of replacement. Grrr! [In through the nose. Hold. Out through the mouth – Ed]. What matters most is that it works fine and that whole area is extremely rigid. The slim seat tube tapers back in a teardrop profile – as does the carbon seat post that slots in up top – and it comes with a cutaway lower section that flows around the leading edge of the rear wheel. Triangular-section seatstays meet up with asymmetric chainstays (for extra stiffness on the driveside) to form a tight back end while up front Giant’s own Advanced-Grade composite fork (with an alloy steerer) takes care of steering. I’ve name-checked most of the components already so let's crack on with the ride and tell you about the rest as we go along. Muscular. That’s how we’d describe the Giant in one word. Take that oversized front end, for example. You can put as much pressure on it as you like and it’ll stand firm. Get out of the saddle and throw the bike around and there’s barely any flex through the head tube, the fork or the alloy cockpit components. The result is a bike you can fire down fast descents and around tight bends in the knowledge that the steering is extremely accurate. You’ll end up exactly where you aim it, and changes of line are a breeze, and that does wonders for your confidence, your speed, and your enjoyment. The mid-section of the bike is equally solid. Get all bossy and the frame never gets bent out of shape. 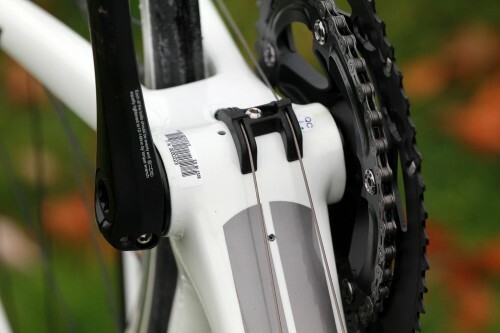 Jump on the cranks and the bottom bracket holds steady, so you don’t have to chase it around with every pedal stroke. That’s exactly what we want when it’s time to get the power in. Weighing in at 8.0kg (17.6lb, for size M), the Giant is pretty light too. Yes, you can get lighter at this price, but it’s certainly a reasonable weight and that, along with the frame stiffness, makes for decent ascending speed. We really enjoyed uphill stretches on this bike. It felt really direct and efficient on the sharp Salisbury Plain climbs it was mostly tested on, giving me a gentle helping hand rather than holding me back. I’ve not used DT Swiss R1800 wheels before but they’re no slouches either. They’re good all-round wheels with a medium depth profile (27mm) and sealed bearings, and I’ve no complaints about Michelin’s Lithion 2 tyres either. They’re not as light or supple as more expensive options in the range but they kept me upright in wet, icy, and downright dirty conditions during our winter test period, so they’re fine by me. The other big characteristic of the TCR Advanced 2 is its comfort. Sometimes a stiff bike will knock you about a bit, transfer every road irregularity through to the bars and saddle, and skip about on uneven Tarmac… none of which is any good for your speed never mind your pleasure. The Giant, on the other hand, feels great. The Fizik Arione saddle helps on that score. I find the slim nose and the amount of flex in the shell just about right (although I’ve never really understood what the extended back section is bringing to the party). But the frame, and probably the amount of seat post you have sticking out of it thanks to the compact geometry, has to take some of the credit for the comfort too. We wouldn’t call it a plush ride, but the Giant doesn’t feel it needs to let you know about on every little bump. We took it on some ridiculously rough roads and came back feeling absolutely fine. The ride position isn’t radical for a road bike although the seat tube angle is just a touch slacker than most and the top tube a smidge longer. What does this mean in practice? Virtually nothing. Moving the saddle backwards or forwards on its rails (you get two different offset options on the seatpost) or swapping the stem makes more difference. What you get here is a traditional-style road race setup, without any sportive-friendly height at the front end. The gearing is pretty traditional too. 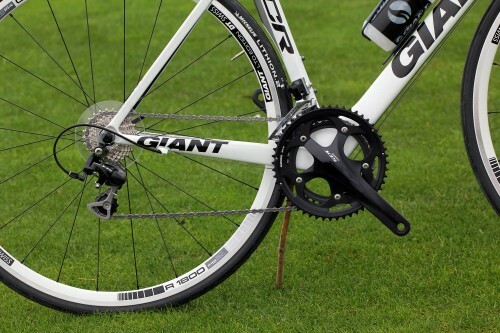 Rather than going for a compact chainset, Giant have stuck with 52 and 39 tooth chainrings matched to a 12-25 cassette. If you’d rather have a lower range of gear options, Shimano 105 does come in a compact (50/34T) version these days. 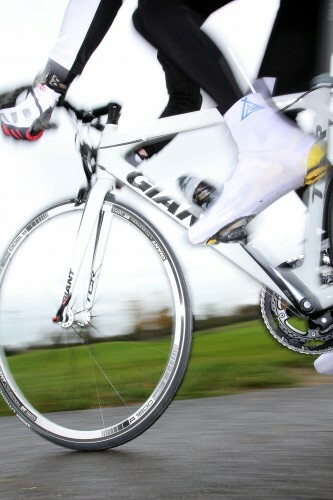 We’ve really liked our time on the Giant TCR Advanced 2. We’ve been impressed. The components might be solid rather than spectacular but the frameset more than makes up for that. This is swift and solid with a lovely ride quality – a really impressive bike. Giant say, "Climb faster, sprint faster, make it to the front of the group faster. if competition is in your blood, this is your bike." "There’s a reason Giant is the world’s leader in composite technology. You’re looking at it - The TCR Advanced is obsessively engineered and hand constructed at Giant’s C-Tech facility for unmatched performance. Its stiff, oversized PowerCore bottom bracket, OverDrive headtube and custom tuning give it an unmatched ride quality." It's a bike for fast road riding - sporty stuff. Sportives, racing, or just getting the miles in at the weekend. Compact frame design = shorter tubes. Shorter Tubes = stiffer = power transfer and more accurate tracking/handling. More extended seat post acts as a dampener, somewhat reducing road vibration fatigue. It is no wonder most of the other bike brands have adopted some degree of sloping top tube design. I'm not convinced that the compact geometry really makes much difference to weight - in reality you're only chopping off an inch or so of a tube. As for increasing stiffness, if the manufacturer can't make it stiff enough in traditional diamond geometry then they need another job. And how come this compact shape has not been adopted by every other brand? Having said that, this bike sounds like it would be great fun to ride. I've seen some of the TCR Advanced bikes in my LBS and they look darned fast standing still! I've read your review and, must say, was relieved to see so many good things about the bike. I purchased a 2011 TCR Advanced 2 in August of last year and am seeking desperate help in riding comfortably. It's my first carbon road bike and from the test ride, I fell in love with everything you said about it. However, then I began having shoulder problems and so adjusted the fit with a professional. I told her I was feeling too stretched out and was having a hard time breathing. She suggested I go down in stem length, which I did. No change. My left shoulder got worse and worse the more I rode. Now, mind you, I've been riding for many years and joined a team two years ago. My riding was almost every day before the new bike and dwindled down to a mere club ride on Saturdays while the rest of the week was spent rehabbing. In January, I had surgery to decompress my shoulder. Kept seeing my bike fit person after the recovery time and tried to ride. Again...shoulder hurts and the bike just isn't comfortable. And new problem...saddle ailment in the soft tissue area. 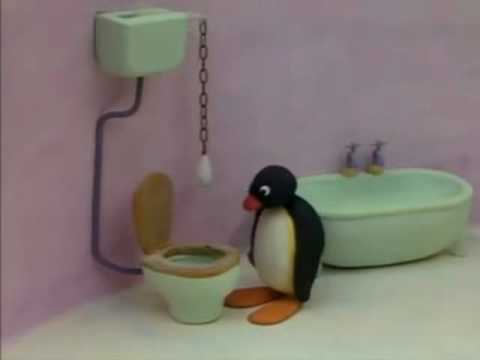 I feel good at first, then so many things go wrong. I've adjusted my cleats, the seat height, the seat position both fore and aft. Even measured the distance between seat and bars, and cranks and seat from old aluminum bike to new carbon one. The saddle ailment, I've levelled my seat to no avail. In watching the Tour, I notice how all the riders are positioned on their bikes and they look so comfortable, or at least content, in how they sit for so many miles. After 20 miles I'm ready to pull a Contador and throw mine on the side of the road. Do you have any suggestions? I'm 5ft 3 inches and the bike is a small. I love that bike and can't imagine not riding. I've ridden with pain before but not like this. Am I so broken that I'm forced to admire my carbon steed hanging from the rafters and only clean the dust from her tubing? Don't mean to break your heart, you clearly love the bike, but maybe the bike is just too big? I'm 5ft6 166cm and I'm using the Small size, I love it. Since there is no XS or XXS version, you're left with only the seatpost, stem or the spacers to adjust.